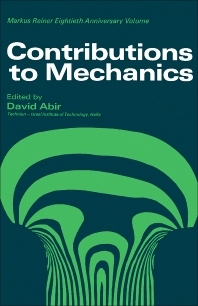 Contributions to Mechanics presents a biographical survey of Professor Markus Reiner's life. This book is a manifestation of affection and esteem to Professor Reiner, expressed by various authors who eagerly contributed original works in the field of mechanics. Organized into five parts encompassing 26 chapters, this book begins with a biographical article of Professor Markus Reiner that includes a detailed account of his works. This text then explores the approach for the interpretation of certain features commonly accepted in quantum theory on the basis of its mathematical formalism. Other chapters present the concept of micropolar fluids and micropolar solids as special classes of micromorphic materials. This book discusses as well the general theory for the isotropic strain tensor. The final chapter deals with the anomalous phenomena of flow that play a significant role in the flow of most biological materials, such as serum, blood, and synovial fluid. Mechanical engineers and scientists will find this book useful.